The Porsche 944 was introduced in 1982 to bridge the price and performance gap between the 924 and the 911 SC. One of our teams drives an entry-level 924, a Volkswagen disguised as a Porsche, a sheep in a wolf’s skin —the 924 carried an inline-four engine from VW/Audi, whereas the 2.5-litre engine in the 944 was developed by Porsche. 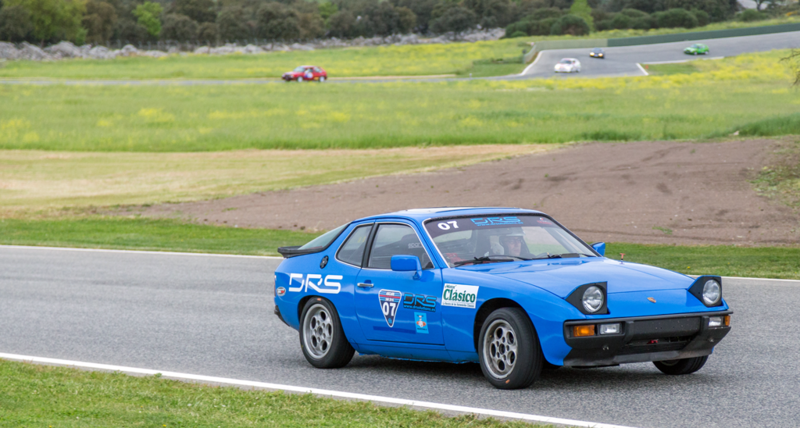 The DRS Porsche 924 during the 24h of Ascari 2016. Flat bonnet, pop-up headlights, and rear spoiler are the key aerodynamic features of the Porsche 924-944 model lines. So, the question posed by the team was, how much of a penalty are the pop-up headlights when they are on? 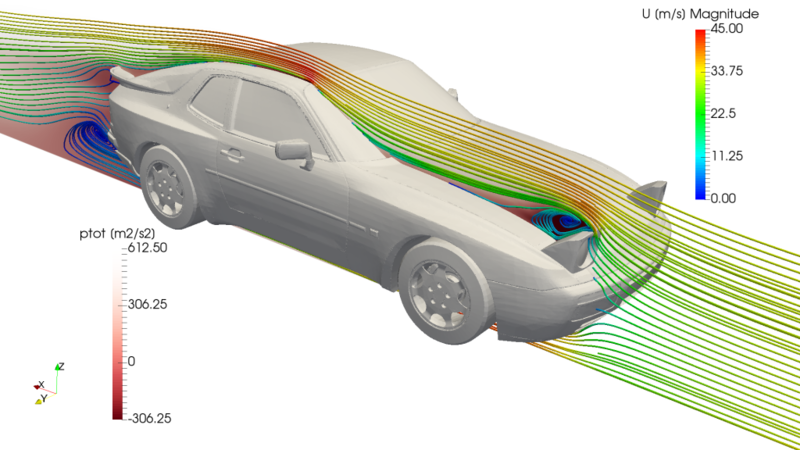 The geometry used for the simulation is that of the Porsche 944 Turbo. It also shares with the non turbo model the striking contours that differentiate the 944 model line from the 924 it is based on, but adds an aerodynamically enhanced front apron and a rear diffuser to the package. The geometry was picked up from GrabCAD and cleaned up to get a watertight model suitable for CFD. The original STL file was created with rendering purposes, so it lacks detail in the unexposed parts of the vehicle, like in the underbody and in the suspension and transmission. 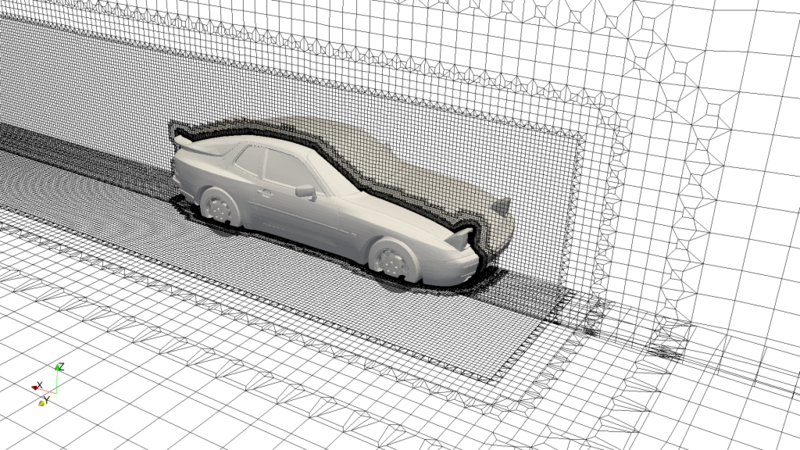 The Porsche 944 Turbo STL file used for simulation. Also, I included closed volumes around the rims to create MRF zones later during the setup of the case. This will allow me to define rotating zones to better capture the influence of the wheels over the surrounding flow and with less computational effort than with a moving mesh. Two simulations were set-up and run in SimScale cloud CAE platform —the platform gives us an affordable web interface to the OpenFOAM CFD toolbox.—: one with the headlights hidden and another with the headlights on. The volume mesh was generated using snappyHexMesh with surface and volume refinements to increase the resolution around the areas of interest such as around the wheels and at the wake. The final mesh is made of 9.5 Mcells which I found from previous simulations to be a good balance between accuracy and computation time given the constraints of the platform. 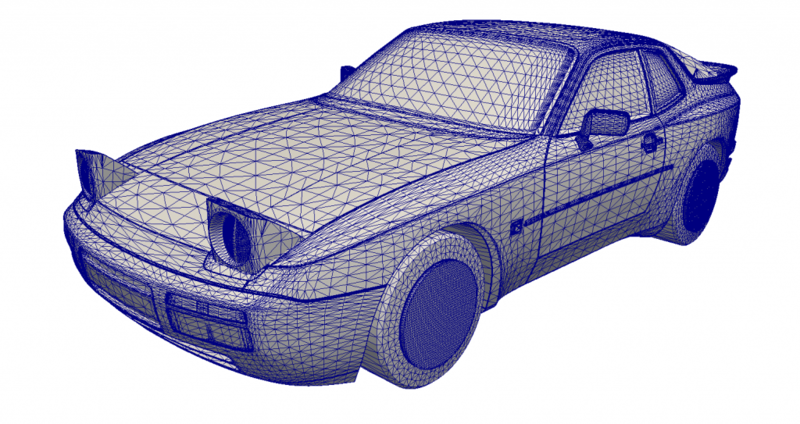 Slices of the volume mesh around the Porsche 944. As initial conditions, we have a uniform velocity of 35 m/s (126 km/h), turbulence kinetic energy k of 0.046 m2/s2, and specific turbulence dissipation ratio ω of 300 /s. This values for k and ω were estimated using the turbulence online tools from CFD Online considering a low turbulence case using and eddy viscosity ratio of 10 (Saxena, 2017). Also, a rotating zone was specified around the wheel spokes in order to better capture their influence over the flow close to the wheels. The following chart shows the accumulated drag comparing the lights on case with the baseline case where the lights are off. It is no surprise that the pop-up headlights increase drag substantially (about +6 %). We are illuminating the road ahead using a blunt body that emerges out of an otherwise streamlined front with massive flow detachment downstream of it. This is evidenced by an increase in accumulated drag just at the front of the pop-up headlights where the flow stagnates increasing static pressure. Recirculation bubbles behind the headlight and rear bumper of the Porsche 944. The difference with the case where headlights are hidden is better appreciated in the animation below which shows the delta of total pressure —hidden minus on—. Blue indicates areas of less total pressure (~ energy per unit volume) whereas red indicates areas of more energy within the flow compared to the baseline case. Total pressure difference between lights on and lights off. We can see that there is an effect not only in the volume just after the lamps, but also in the underbody and at the wake of the car from the centerline towards the sides. This is because, now that we added an obstacle, the air has to find new paths that offer less resistance —I like to think of it as a series of resistors in parallel; so that if we modify one resistor, the current will redistribute itself. In this case, there’s no big difference in the pressure distribution in the underbody of the car. But the front of the bonnet sees a different picture. The following picture shows the z-component of pressure coefficient —red is for lift and blue is for downforce. Porsche 944 lift coefficient. 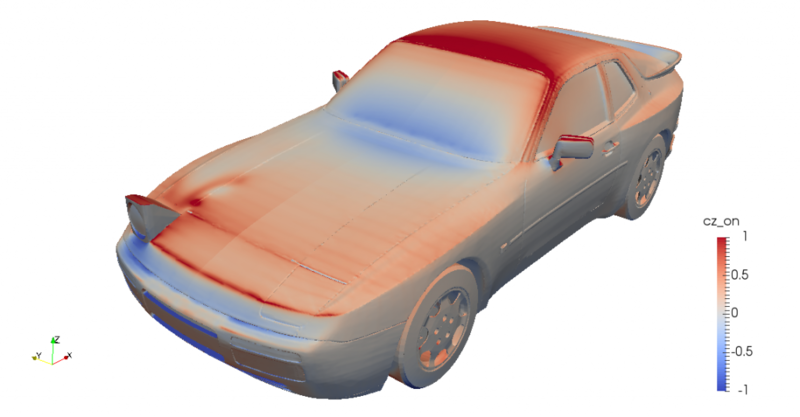 The picture results from a combination of the two simulation runs to show the effect of headlights on the z-component of pressure coefficient. This geometry does generate little downforce —almost neutral— compared with competition vehicles (McBeath, 2015). Turning on the lights reduces downforce by 260 counts; which does not seem a big change in absolute terms, but accounts for almost 60 % of the downforce for this geometry. Many cars with pop-up headlights saw the darkness of night —the Corvette, the Miata and RX-7, the Sprinter Trueno, or the Testarossa just to name a few—, until 2004. That year saw the last hidden headlamp out of a production line. Pedestrian safety regulations followed by new advancements in lighting technology were the main factors leading to their disappearance. But in racing, pedestrians are not a major concern, being far more important aerodynamic performance and reliability. Just take a look at the following ad. 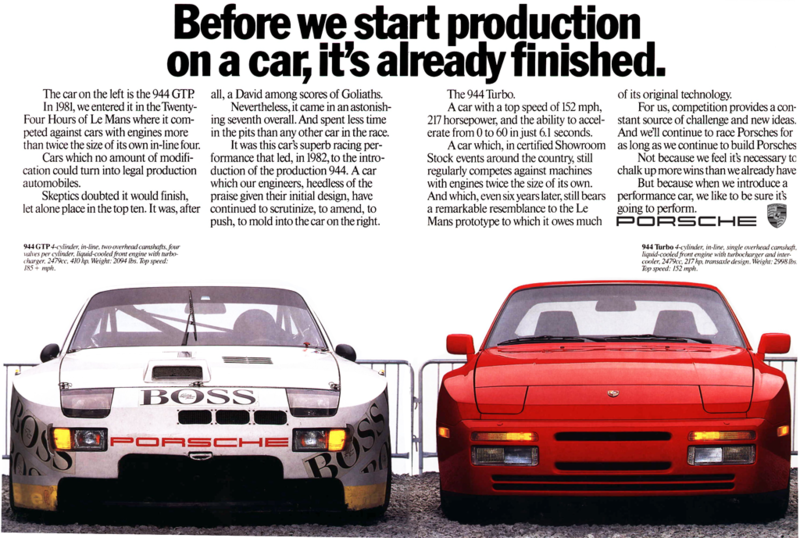 The Porsche 944 GTP race car with conventional headlights alongside her street sibling. The Le Mans version of the car used conventional lights covered by a transparent cover maintaining the style of the car. With at least one-third of the race taking place during the night, reliability of the lighting system is very important; and so is keeping aerodynamic drag as low as possible, which reduces fuel consumption and in turn leads to less time in the pits. McBeath, S. (2015). Competition car aerodynamics: a practical handbook (3rd ed). Poundbury, Dorchester: Veloce Publishing.